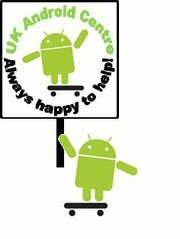 Uk Android Centre is a UK based team that gives user of Android devices any help and advice with their phones. We also give advice to people who want to know what the best apps for your Android phones. Some of you may know that we have our own app that is linked to this website so you can take us anywhere in the world and if you have a problem with your phone we can help you at anytime so you have not gone without your phone or anything. There are a few ways that you can get our app by scanning the QR-Code below or by click here you can down the app straight to your phone as apk file.